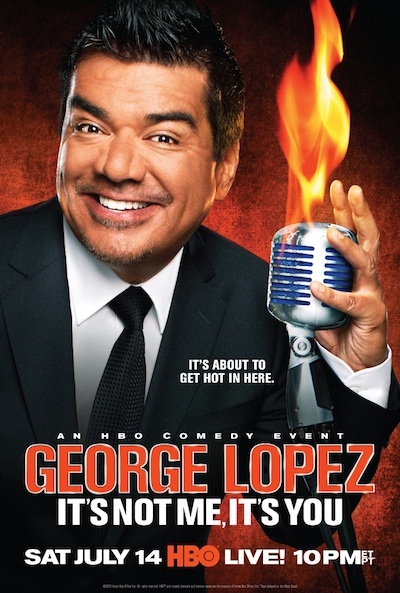 An HBO favorite returns this summer for his third live solo stand-up special on the network when GEORGE LOPEZ: IT'S NOT ME, IT'S YOU debuts SATURDAY, JULY 14 (10:00-11:00 p.m. live ET/tape-delayed PT). Presented from the famed Nokia Theater L.A. LIVE, which he has previously sold out 24 times (a record for the venue), the exclusive presentation features Lopez in performance before a live audience. In this all-new special, Lopez discusses the state of Latinos in the United States and is expected to cover topics such as dating and marriage, alcohol and drugs, parenting, irritating pets, Latino environmental firsts, getting old, the behavior of children today and the importance of teaching them "the hard way." He also talks politics and reveals his thoughts on his visit to the White House. "Comic Relief 2006," the HBO Films presentation "Real Women Have Curves" and guest commentator duties on HBO Sports' "Inside the NFL." He also appeared on 2009's "We Are One: The Obama Inaugural Celebration at the Lincoln Memorial." The Los Angeles native also starred in his own self-titled hit sitcom and talk show. His other credits include twice hosting the Latin Emmy(R) Awards, co-hosting the Emmy(R) Awards, the Grammy-nominated CDs "Team Leader" and "El Mas Chignon," the bestselling autobiography "Why You Crying?" and such feature films as "The Spy Next Door," "Mr. Troop Mom," "Balls of Fury," "Beverly Hills Chihuahua," "Marmaduke," "Rio" and "The Smurfs." Lopez is also the host of the provocative broadcast network dating series "Take Me Out," which premiered in June. Lopez has received numerous honors for his talents and charitable endeavors, including the 2004 Artist of the Year and Humanitarian Award from Harvard University. That same year, he was honored with the Spirit of Liberty Award by People for the American Way. In 2005, TIME magazine recognized Lopez as one of "The 25 Most Influential Hispanics in America" and TV Guide named him one of the "Top 50 Greatest Television Dads of All Time." In 2006, he received a star on the Hollywood Walk of Fame. GEORGE LOPEZ: IT'S NOT ME, IT'S YOU will be produced and directed by Troy Miller, who served as an executive producer and director on the HBO series "Flight of the Conchords" and "Bored to Death."